How Can I Tell If My Tires Are in Good Shape? Car tires only have a certain service life. A vehicle must always have tires that are suitable for normal driving conditions. Many people who live in colder climates have two sets of tires - one for winter and one for the rest of the year. Keeping your tires in good condition is imperative for keeping your car operating as safely as possible; if your have worn treads you won't make as good contact with the ground which will delay braking time. 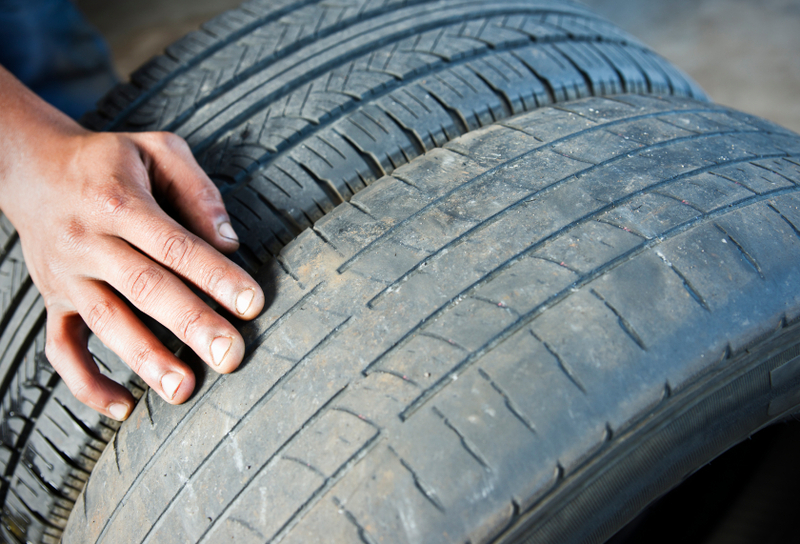 Knowing what to look for in the quality of your tires will let you know when it's time to replace them. Dry-rot: The tire has good tread, but has cracks in the side walls know as “weather checking” or “dry-rot.” This usually occurs later in the tire’s life and can happen if a vehicle is parked frequently outside in high temperatures. The tires are made of different layers: As the tire gets older, or is damaged, the tire can start to come apart, developing problematic bulges that affect your drivability. Suspension alignment problems: The tires will wear out if the suspension is aligned incorrectly, which can pose a serious safety hazard. Check your tire tread to detect wear: Try the penny test. Insert it in the tread with Lincoln’s head upside-down. If you cannot see Lincoln’s hair, then your tread is in good health. Consider new tires if you see his hair, and replace them if you see his head. Look for tread-wear indicators: These are bars of hard rubber that only appear on worn-down tires. If these indicators appear in two or three places, it’s time to replace your tire. Look for items lodged in the tire: These can include nails, small stones, or thumb tacks. If you hear a hissing sound when you pull out a nail, push it back in quickly and get the tire fixed. Tires with leaks should be patched by a professional. Look at the sidewalls: Check for scuffed or worn areas, bulges, and holes. Read more about knowing when to replace a tire and be sure to have a certified mechanic, such as one from YourMechanic, inspect the tires for uneven wear to check that your vehicle is in need of new tires. Q: Are Low-Profile Tires More Likely To Blow Out Or Puncture? Q: Is My Spare Tire Still Safe to Use?